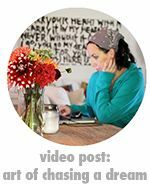 Becoming a mom has been one of the most inspiring and profound things to happen to me and my creative process. I cannot say enough about how wonderful it is to be able to sit down and create with my daughter. This time of year is my favorite because I spend a lot of time crafting for our home and for gifts. It is something I have doing since I was a kid (thanks to my mom) and is an important tradition in our home. 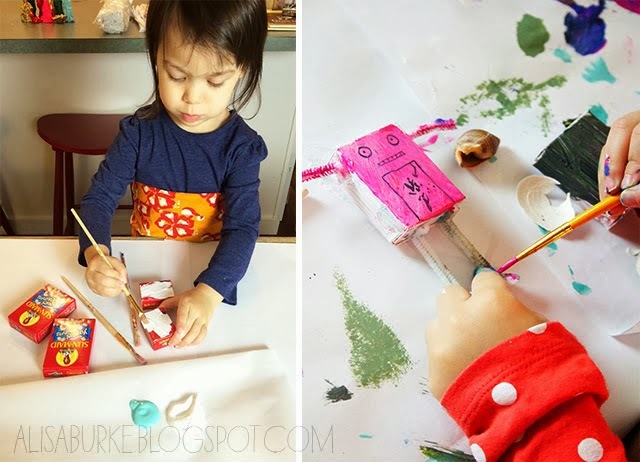 Lucy has been part of my art and crafting process since she was born and now that she is 2 we are having so much fun creating holiday projects that she can make her own. lucy create from Alisa Burke on Vimeo. As I have mentioned in the past it is important for both my husband and I to incorporate Lucy into as many creative projects as possible. 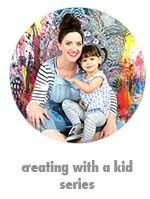 And while it makes no difference to us if Lucy grows up to be an artist, we do want her to be a creative thinker. We feel that including her in our daily art and craft-making process is one the best ways we can teach her to do this! Part of including her in this process means letting her explore and find her own voice which. This means I typically let her take the lead when we are creating. If she uses her hands- I use my hands, if she scribbles- I scribble, if she mixes all the colors together to make mud- so do I. Often I have to fight the urge to correct her or make something for her and I always limit showing her the "right ways" to draw something. As an artist, I know all too well that there is only one time your life that you are truly free from expectations and rules in creativity and that is when you are kid. I try to keep the supplies simple and limited. 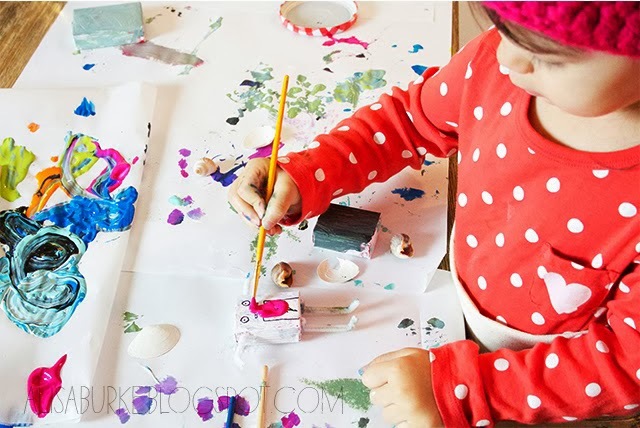 Lucy is only 2 and while she is really advanced in her art and crafting skills, she is still a toddler who has a short attention span, she is a bit destructive and often gets overwhelmed with tons of supplies. Working on one project at a time or picking one project per day seems to work best for us. Cover your surfaces! I have found that even if we are not painting, it is handy to cover our work surface. Crafting with a kid is so crazy messy that it helps to have your mess contained and easy to clean up. Limit the color choices. While I love giving Lucy a huge box of paint in every color, I have found that limiting the colors choices to 3-4 at a time makes life a lot easier for her and I. She gets to choose her colors and use them however she wants. Once she has used up the color, we select 3 new ones. Don't invest lots of money in supplies. 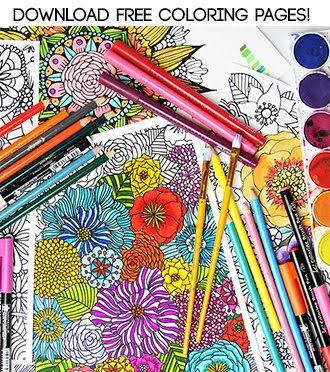 While it is tempting to grab every kid's art supply out there, often it is the everyday things that end up being the most fun and creative. Lucy's favorite things to create with right now- a roll of masking tape, a black pen, a recycled cereal box and ruled notebook paper. It is amazing just how creative you can get with simple things! 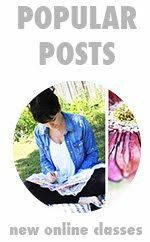 Nature is a big part of our lives and I love finding ways to incorporate natural elements or things we have found into our crafting projects. 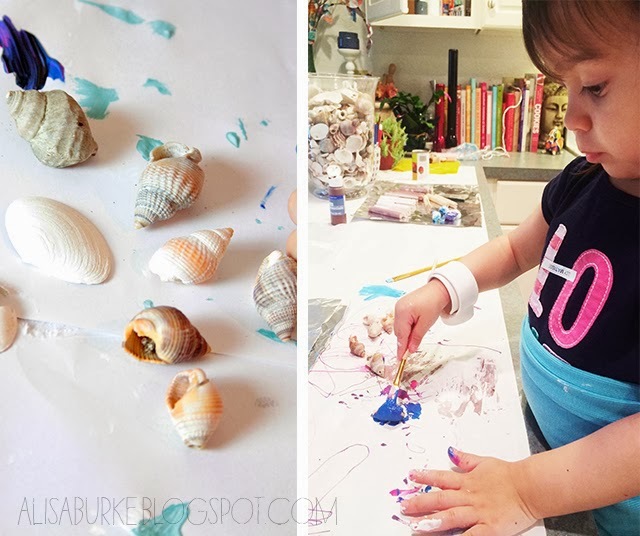 One of Lucy's favorite projects is painting the shells we have found on the beach. 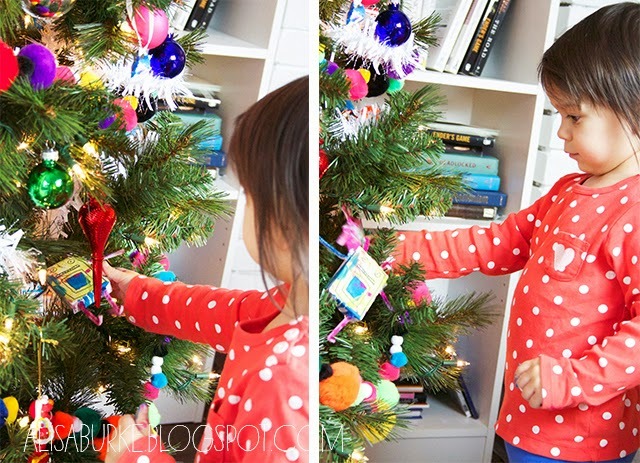 This year we added ribbon and turned them into toddler proof ornaments that she can take on and off the tree without worry. Make hunting for treasure part of the creative process. Spend time outside collecting objects and then work together to find ways to alter those things. Just about anything can be painted and hung on the tree- small rocks, shells, twigs, pinecones and leaves! 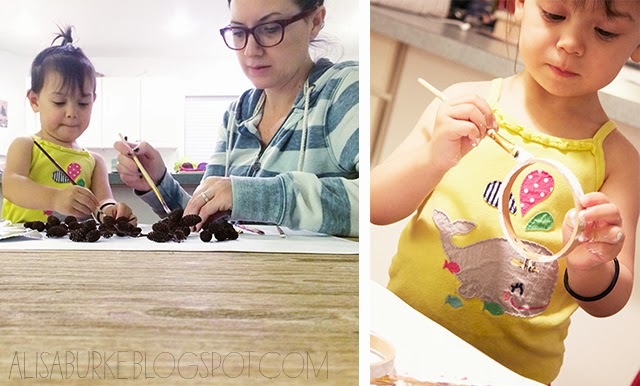 We spent over 1 hour (thats a record) painting pine cones that we collected in our yard. Then we transformed them into mini wreaths by gluing the pine cones to tiny embroidery hoops. One of my favorite holiday projects as a kid was making toilet paper roll angels for the tree- I am pretty sure this is when my passion for upcycling began! 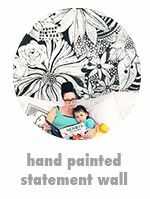 (You can see my grown up version HERE) Recycled materials or even things that would get tossed in the trash make such great crafting supplies for a toddler. A little bit of paint and you have a fresh surface that can be transformed into anything! 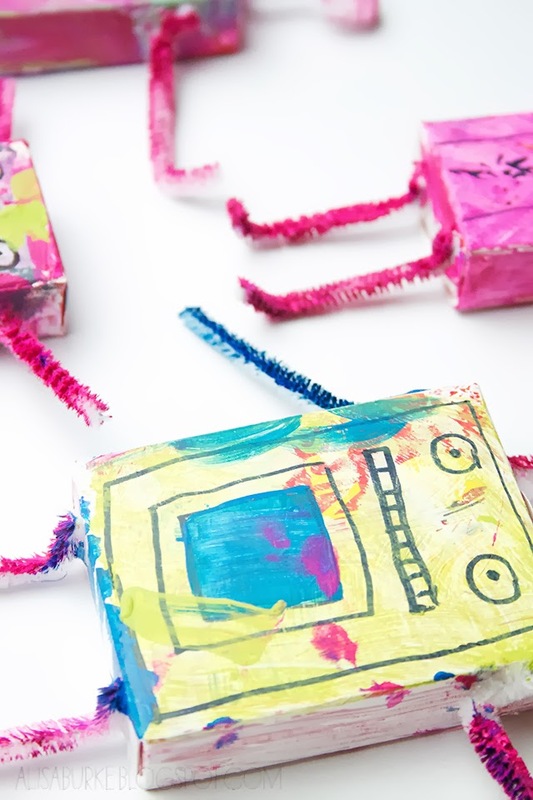 We transformed some raisin boxes into Lucy's favorite thing right now- robots for the Christmas tree! She primed the boxes with white paint and I added a simple robot face (with her directing me!) and then she continued to add more paint and her own embellishments. Save anything made of cardboard. 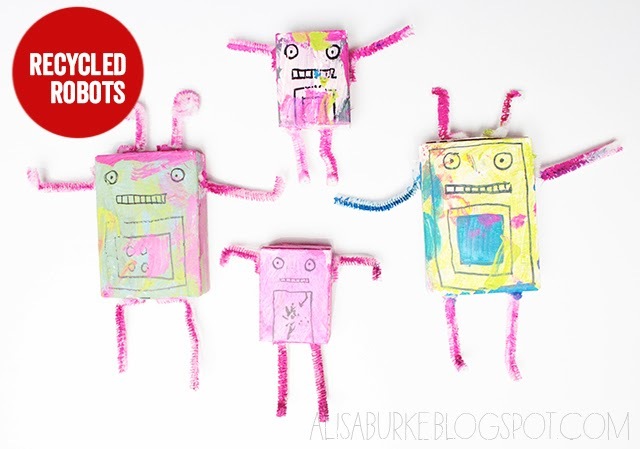 Cardboard can be painted, glued, altered and cut up into just about anything! Make recycling or an awareness of recycling a part of the process. If something needs to be tossed, pause and make it an opportunity to have a creative conversation about what it could be transformed into. 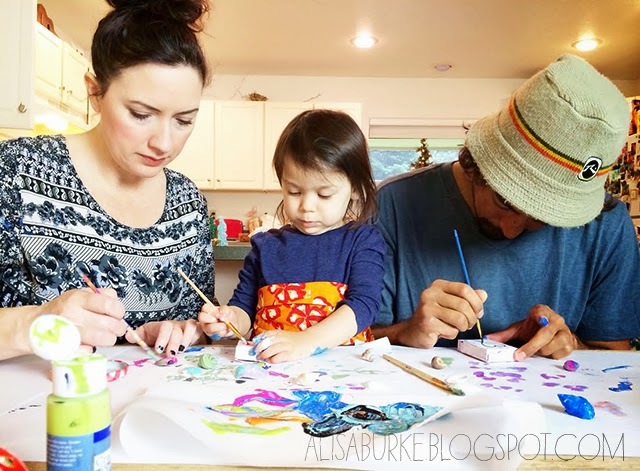 Kids are great at painting in colorful and expressive ways and I always try to embrace and encourage this when Lucy and I are crafting together. We do a lot of painting on all kinds of surfaces and the best process for creating colorful projects is to work in layers. I let Lucy go wild with her four colors then we set everything aside to dry. Once it is dry we pick 4 more colors and keep painting- while mixing color and making mud is great sometimes it is also nice to hold onto all those wonderful expressive brushstrokes. 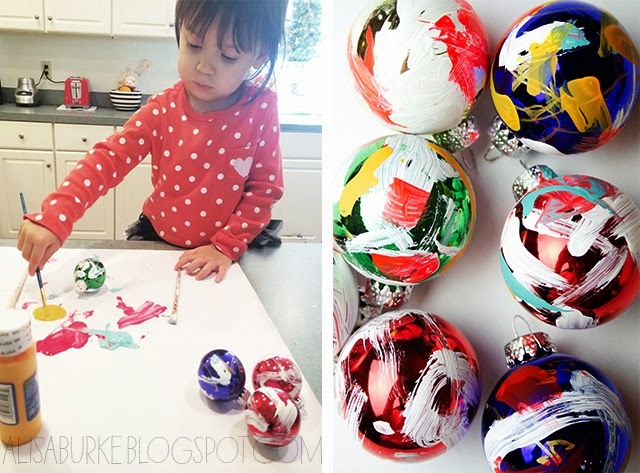 We used cheap plastic ball ornaments and Lucy painted all over them with lots of colorful and messy brushstrokes. Waiting for paint to dry, especially when you are working with a toddler can take up a lot of time! 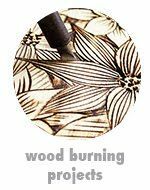 To speed up the process use a hair dryer, a heat tool or even the oven. Try working on one layer a day for a couple of days. Once you add paint to the mix, there WILL be a mess. The best advice I can give is to embrace the mess and think about clean up when it is over with. 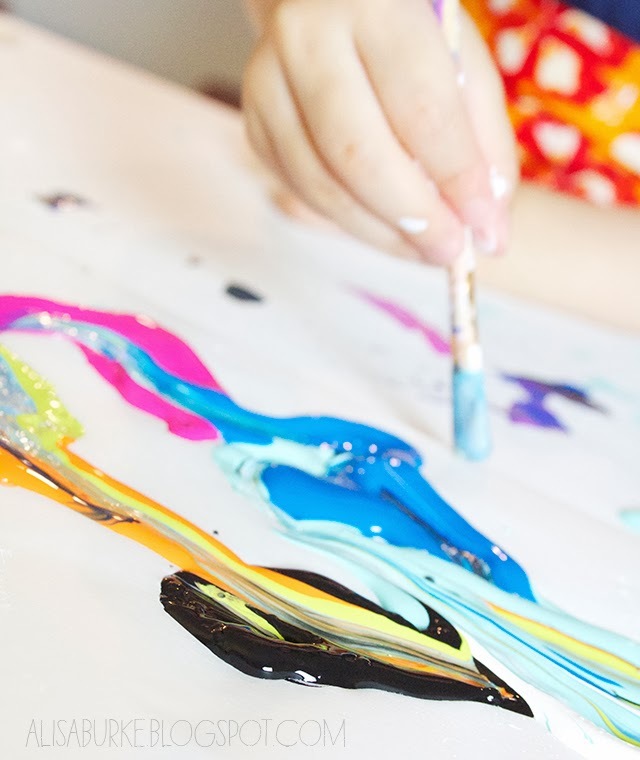 Let your kid explore and experiment with the paint and different ways to make marks (typically this means hands in paint). 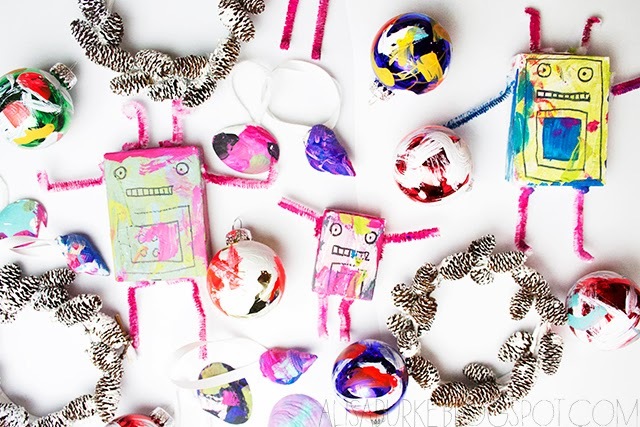 In the last few weeks we have been putting all of our ideas and creativity to use to create a fun little collection of handmade ornaments that are ALL LUCY! She has the entire bottom half of the tree where she has our blessing to decorate, redecorate and play with all of the little goodies that she made. What about all you mamas out there? 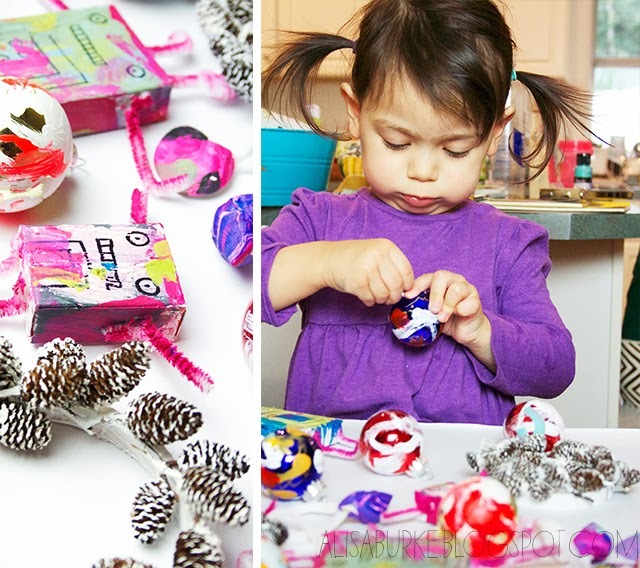 Do you have favorite crafting projects or tips that have worked for getting crafty with your kids? 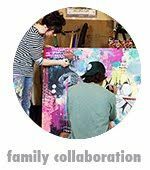 For more of my tips on creating and collaborating with a kids you can visit HERE, HERE, HERE.To follow my entire journey as a mom and read more about our creative collaborations you can visit the Life With Lucy link in the right hand column. Those are some great tips! 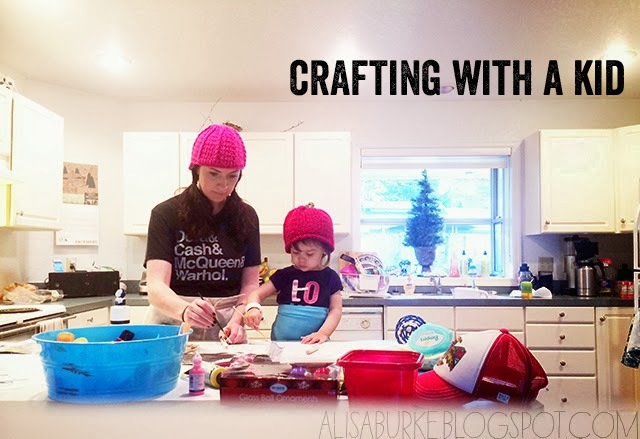 My kiddo will be 8 next week, but we have been doing all kinds of crafting things forever. We LOVE upcycling our cardboard boxes. Best (and cheapest) painting surface for kids. One thing we did for a short period of times is I would give my kiddo a few colors all from the same color family (pink, red, red violet, rose, etc) and let her have a field day. Also, we keep all the canvases she paints on. When she decides she doesn't want to keep a particular "master piece," we paint over it (often times taking pictures first). What a sweet and great post! Thanks for always sharing the many ideas with us! Love your philosophy & the results! I am raising 3 creative thinkers myself - now as teens & pre-teens, they are each overflowing with creativity in their own ways! Very inspiring! Love the video...it's priceless!! 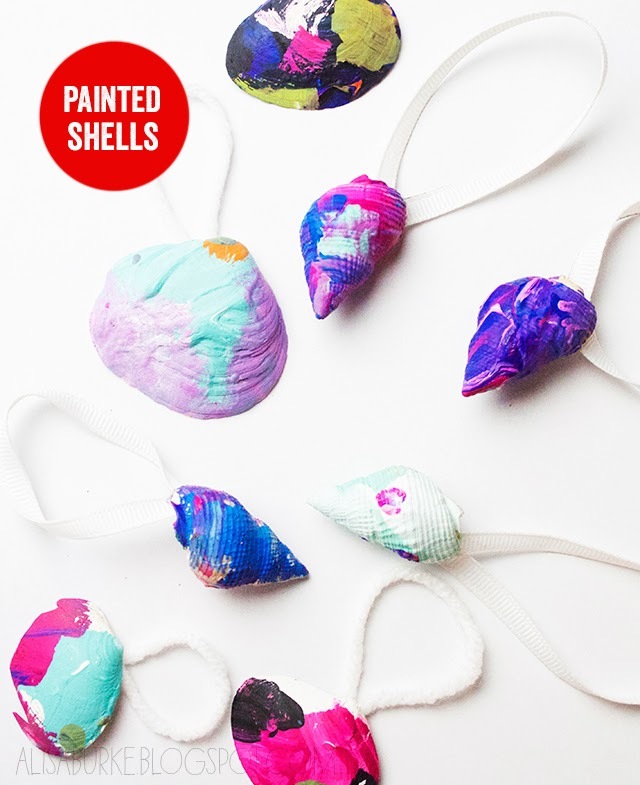 When my daughter was young we made those homemade play dough type ornaments that you cut out with cookie cutters, baked then painted!! It was so fun!! 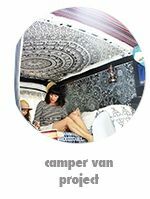 Thanks for sharing...it's a real joy to watch Lucy evolve into an independent artist! thanks Alisa.... my kids are all grown up, but all your tips inspire me in my own creative process. E' meraviglioso vedervi tutti all'opera! It 'wonderful to see you all in action! My girls are all older now (and one is majoring in art! ), but they usually crafted in just their undies, and there was the promise of playtime in the bathtub at the end of a crafting session. Great post! Love the nearly matching hats in the top photo, and the little box robots are fabulous. We did the same with our christmas tree in the early days, and the kids loved having that freedom. Wonderful Projects. I love to see kids doing art. I love Lucy. She so beautiful. Could she be any cuter!! What is the song played in the video? Love all the projects, but I'm with Lucy...the robots are just too cool! ;D I love how you encourage Lucy to make her own crafting decisions. You are a very wise and kind soul. Some of my best memories are crafting with my grandmother. She would mix water and flour together and make paste. Then I would cut up seed catalogs and make collages with all the flower pictures. She saved tin foil, fabric scraps, etc. for me to craft with. I think my love for art comes from her. Thanks for sharing this wonderful post. Beautiful post and video! Thank you for sharing your very sweet Lucy with us! This all brings back many memories for me, as I saved all sorts of fun stuff for my girls to play with. They created many fun things, some of which I still have (to include ornaments that still decorate my tree after more than 40 years!). I treasure that special time and fun we had. I might add that my first daughter had my undivided attention for nearly her first 3 years and thus got the most out of our creative times. She studied design for architecture in college. Allowing children to be free and do their own thing with creative materials is the best way to encourage their individuality. When they get to school, they all want their art to be the same as the other's, which it can never be - after all, we all have our own way of writing our names. Creativity is the same. I congratulate you both on what you are doing with Lucy. you are wonderful!! yay yay yay!!! :) xoxoxo lucy is the sweetest little artist. :) xoxo and thank you for such encouragement..!! I LOVE watching the Lucy videos you post!!!!! I am not a mama, but a creative auntie. I have been a fan of Journey, especially Steve Perry, since the '70's .. so I have lots of their music and videos, etc. .. so when my niece would come over I would always be playing their music/videos .. I would always encourage my niece to draw me pictures of Steve .. I still have those drawings! .. and she is now a student of the American Academy of Art in Chicago .. doing what she loves .. drawing! 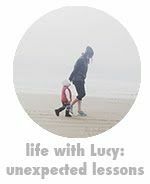 I adore seeing how creative you are with Lucy and it's obvious to see that the creative process you've got really works. Unfortunately mines now 13 and tempting him to craft is hard work but he knows he's always able to if he fancies, thank you for the inspiration. 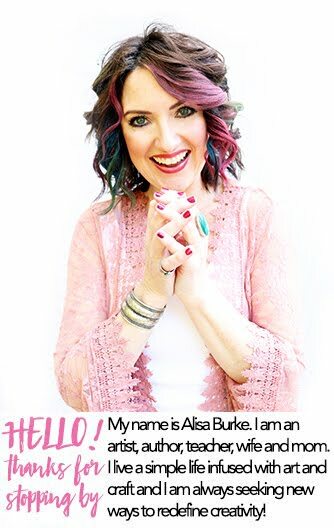 Dear Alisa! Thank you for this wonderful post! My daughter is too small yet for such entertainment... but now I have a lot of ideas for the future! 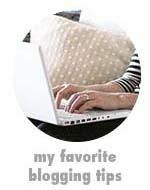 Alisa, this post brought back so many memories for me. My children are now 20 and 17, but when they were younger, we did so many creative projects together. Sometimes, the house was just so full of creations! It must be the same around your house. They are growing up to be very creative thinking, in very different fields. I think those earlier experiences has thought them a way of thinking and a way of life. Thought provoking, indeed. I promised myself today I would do one thing that scares me, the thing of the day is to introduce my 21 mo. old to paint. (Its the mess that is daunting). Something we do regularly , I stitched up a thick sketch book, I keep crayons and markers in a bag and we pull it out almost daily to doodle in. I love that it nearly has a year of family scribbles poem's notes and hand and foot teachings and it is all bound together in a book. Thanks for continuing to inspire! 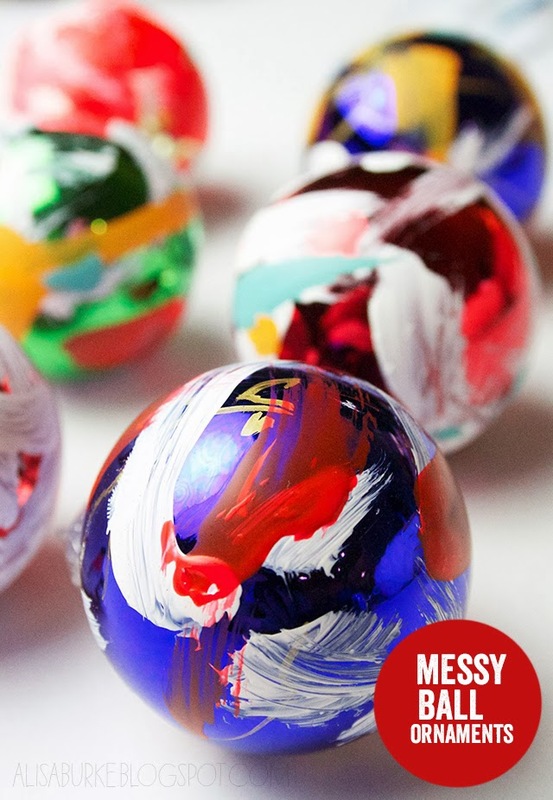 even if I am myself messy when i create I get really nervous when my girl wants to paint... mostly because I know that I will spend twice more time to clean up than she will do creating, and maybe it will involve some "accidents" on the floor or clothes even if I try to protect at the max! and now she's 4 so she knows where my supplies are and sh wants to have everything out herself... I really need to relax about this! Those plastic tablecloths with the fleece backing make it easy to contain the mess. You can usually find them with the seasonal decorations (mine has easter eggs on it). They are very sturdy. I lay one on the table or floor when we start crafting and I don't even bother to wipe it clean when we are done. Just let it dry, fold it up and put it away. Looks better with more paint on it!! Yay! That is awesome. 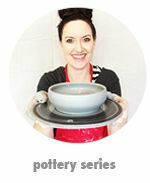 You can see in her little face all that she is gaining from these creative experiences. It is also wonderful that she knows she can go to the bottom half of the tree and play with her ornaments. Job well done Alisa! I love this! 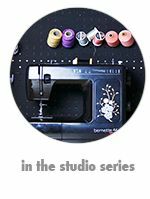 I have a 16 month old and I know she already loves to watch me sew and watch my husband work on his bookmaking projects. I wanted to get her involved with creative time, but wasn't sure how. I'm already getting ideas for next Christmas :) Thank you for posting this and keeping it fun and simple! a joy filled holiday to you! 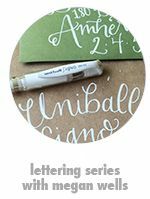 a free little class for you! lisa leonard christmas ornaments and a coupon!